This op-ed was first published in The Weekend Australian today, Saturday 9 April 2016. From the moment of his election Francis has been a Pope of surprises. One of the surprises of this old man has been his energy. It has been astonishing, and part of the energy has been literary — as we see in his latest production, published yesterday, The Joy of Love: On Love in the Family. In it, the Pope wants to gather up and move forward the work of the Synod of Bishops held in Rome in 2014 and last year. The decision to hold the two synods on the theme of marriage and the family was a surprise. But it was shrewd strategy from a Pope who is nothing if not a strategist. What Francis was saying to the Catholic Church was that a synod wasn’t just a one-off event; it’s an ongoing journey, which is what the word synod means. In The Joy of Love Francis doesn’t claim to be the final word settling every controversial question. Nor does he claim to offer a comprehensive pastoral plan to be implemented around the planet. His claims are more modest, and for that reason more compelling. He wants this text to be another step on the way; not a final product but another part of the process. Modest Francis may be, but this is an ambitious offering. That sort of tension undergirds all he writes here. The Joy of Love is high-visioned but also homespun. He offers the grand and ageless poetry of the church’s vision of marriage and the family, which has the deepest roots in the biblical tradition. Francis is not afraid to name the dark side of marriage and the family as it appears in the very different cultures of the world. At times he seems to rub our noses in the facts of marriage and the family, even when the facts are unpleasant. Yet out of the mess he always seems able to make the title of his text, The Joy of Love, seem more than vapid dreaming or whistling in the dark in a world where joy and love can seem a mirage. He opens up a huge vision of possibility for marriage and the family when that vision seems to be shrinking. So often so little seems possible; yet here is Pope Francis speaking of a hope for marriage and the family that reaches beyond all the seeming hopelessness. Of course he says the church must speak the truth. But that isn’t enough. If that’s all we do, then we run the risk of turning the great truths of Christianity into stones that we hurl at those we want to condemn. We also need to walk with people, all kinds of people, especially those who are struggling in their marriage or family life. It’s what Christianity has to offer in an often merciless world. To walk with people, whoever they are, means to enter into dialogue with them. That means we listen to people, whoever they may be and however far they may fall short of the ideal. For Francis, the ideal does matter; the vision must be kept clearly focused. But if we speak only of it, then we can drift off into some abstract noosphere that doesn’t breathe the air of reality. The Joy of Love insists we have to deal always with the facts, however messy they may be; we have to be in touch with the reality of marriage and the family. Among the facts is that marriage is the sexual sacrament, and Francis doesn’t at all shy away from speaking of sexuality. At last year’s synod the talk about sexuality at times seemed somewhat disembodied and abstract; not surprising, perhaps, given that most at the synod were celibate. But there’s nothing disembodied or abstract here about what Francis writes of sexuality in marriage and the family. He speaks openly of passion and the emotions, but also of education in human sexuality for the young. The language Francis uses is crucial; and The Joy of Love is certainly a call to change the way the church speaks about marriage and the family. In part this is because most people these days don’t understand the language we use; nor do they share our assumptions. There is a crisis of communication. We’re in search of new words and images, and Francis is a serious help in that. He speaks in a way we haven’t heard from a Pope for a long time, perhaps ever. The Pope’s idiom isn’t static but dynamic. Marriage is not a state but a journey. The ideal is the point of arrival, but the real is one of the many points on the way. The community of the church has to journey with people, humbly and humanly, before they’re married, when they’re preparing for marriage, in the early years of married life and all the way until death brings the journey to an end. That journeying means listening to the truth people speak, even in the midst of the mess, but also offering them — tenderly (one of Francis’s favourite words) — the hope that much more is possible. Accompanying people on the way also means discerning with them the truth of their journey and even the movement of God in their life — because the real God moves also in the mess. God is not only the point of arrival, awaiting the successful at journey’s end. God is also, says Francis, our companion on the way, with all our failures; and people need to be helped to discover that truth. Popes traditionally have spoken as “we” rather than “I” and with good reason, because Popes gather up the wisdom not only of ages but of a vast worldwide community. In that sense, the Pope — even a distinctively voiced Pope such as Francis — always speaks in the first-person plural. In The Joy of Love we have not only the words of an extraordinary human being and pastor but also a wisdom that is deep and wide when we’re not always wise, not always joyful and loving, in addressing the many complex questions concerning marriage and the family. What Francis offers here is not just for the church; it’s for the world. 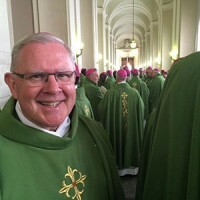 Mark Coleridge is the Catholic Archbishop of Brisbane. This entry was posted in Uncategorized on April 12, 2016 by ACBC Communications.